Are those TTs 1200 or 1210? A pair to... You have hankerings to be a DJ Roy? Man you have some reading to do It's all here fella, you just need to look. Lubricating oil & Sumiko Headshell delivered today, Nagaoka MP110 on it's way. 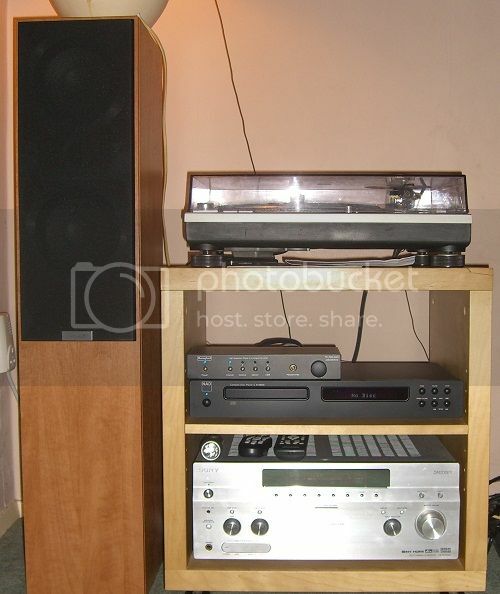 The two downstairs systems ( )as they stand, not that eclectic I know but things are starting to sound ok. Thanks everybody on here for all the advice etc. Great throwback there to some fine equipment. Doesn't the amp run hot? Hi-Fi: SRM Tech Arezzo, Ortofon 2M Black, Graham Slee Reflex M Ultra Linear, Moon 300D DAC, Sony DVP-900V (transport/SACD), vdH Rock Hybrid (3T) XLR, GRAAF GM50b, Triangle Genese Trio, Partington S Dreadnaught, BK XXLS400FF. Head-Fi: AKG K701 & Graham Slee Solo Ultra Linear. HT: Panasonic DMP-BD85, PS3 (for3D), Phillips 46PLF9705, Onkyo TX-NR 709. I shouldn't ask, but what's happened to the Zero 100? Currently in a cupboard awaiting attention. To be honest it's probably not worth getting repaired but can't bring myself to bin it. Haven't noticed, it does suffer with a crackly channel for the first couple of minutes after switching it on but then sound fine. I've tried it with some Wharfdale Diamond 9.1s and the Missions are a lot better.